Quinn has a new guru. It is Grumpy Cat. If you're familiar with Quinn's work, this totally makes sense. 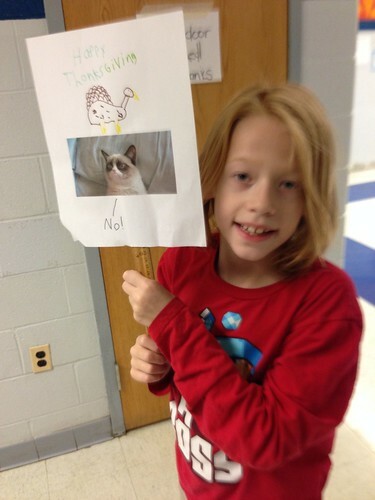 I tell you this because when Quinn thought he had to make a sign to carry at his school's Turkey Trot activity, he wanted to incorporate Grumpy Cat. Because what says happy thanksgiving, like a cat in a terrible mood? More on this later. The Turkey Trot was supposed to be a mile-long walk through the neighborhood around the school with parents invited to join in, followed by hot chocolate. Unfortunately the weather today was a heavy mix of rain and snow and hail, so instead of cruising through the neighborhood, the kiddos tried to run as many of the 24.1 laps around the gym that makes up a mile. 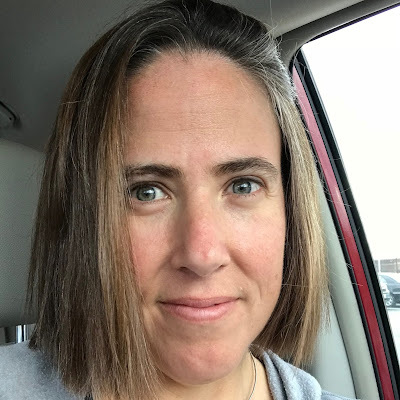 Perhaps because of the venue change, I was the only parent from Quinn's class who showed up to watch the kiddos run, walk, skip, dance, and otherwise ambulate around the gym. I only went because Quinn was expecting me and I wasn't about to change the script on him because of the rain. I'm so glad I did. I got to watch him smile and laugh and talk and play with his new good friend in the classroom. I got to see him talk to a kid I've never even heard of before. I got to talk to a lot of teachers and paraeducators who work with Quinn that I hadn't met. I got to see him show his sign to all the staff, who told him how great it was. I got to see him be happy and comfortable at school. Even knowing that he still struggles there, that means so much to me. So even though Grumpy Cat might not approve of a happy thanksgiving, I sure do. May all of you, American celebrators or not, have a wonderful day full of love and joy and smiles. And hopefully cats, grumpy or otherwise. I wish you and your family a great Thanksgiving! Quinn and his cats! I like cats,too. Maybe he's thankful for Grumpy Cat, I originally thought. Just me trying to fit Grumpy Cat into Thanksgiving. Did you know there is a Grumpy Cat's Worst Christmas Ever movie on Lifetime (yes, Lifetime) this Saturday. As in 2 days, November, 28 at 8pm. On Lifetime of all channels. Grumpy Cat is voiced by Aubrey Plaza from Parks & Rec. Just wanted to make sure you knew about that. Just in case Q was interested. Glad to hear school is better for Q this year. I had a little something to add to my post. And for something from my world, my mom thinks I might have magnesium deficiency. When I was a kid, I tested low in magnesium, but only took the tablets a brief time. I was on other stuff then as well and something made me jumpy. Since then, I've taken a just a multivitamin, flaxseed and flax oil, cinnamon and fish oil.